This spooler is used to wind fiber, tubing, wire or other material from a supply source or spool onto a take-up spool. Its primary use is in winding extremely fragile tubing but it can be used to wind anything that can be held by the take-up shaft. The wind parameters (speed, pitch and target reel width) are set through the operator panel. The winder adjusts winding speed automatically to maintain material feed slack as determined by the dancer. The material is guided back and forth across the take-up reel so it lays in a tightly packed manner. The guides use rollers to prevent damage to the tubing caused by dragging it over a fixed part. Load cells in the spool heads weigh take-up reels allowing for consistent fills. This spooler combines multiple production features into one package that is easy to set up and adjust. Once the process parameters are set, a wind can be repeated by pushing the RUN button. 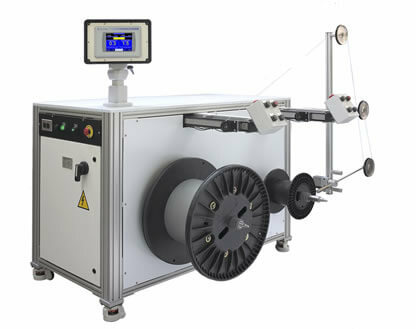 The ability to easily switch reels maximizes throughput during non-stop runs. Waste is minimized as the process is precisely controlled. Send us your spooler specification and we will recommend the best solution for your needs. Note that being a premier machine design firm we can also customize your machine to your dream needs. Material Type, Production Rate, Process Configuration, All you need to do is ask!